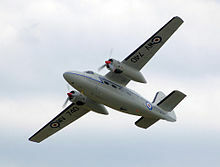 The Percival Pembroke was a British high-wing twin-engined light transport aircraft built by the Percival Aircraft Company, later Hunting Percival. Airplane Picture - Percival Pembroke C.1 of Bomber Command Communications Squadron at Blackbushe Airport Hampshire in September 1956. Six were produced as the Pembroke C(PR).1 photographic reconnaissance aircraft. these saw use by No. 81 Squadron RAF during the Malayan Emergency. The RAF's Pembrokes were modified to extend their lifespan in 1970. The last unit to use them was No. 60 Squadron RAF based at RAF Wildenrath in Germany, these were withdrawn from use in 1988 and were replaced by the Hawker Siddeley Andover. The Finnish Air Force operated two aircraft for aerial photography between 1956 to 1968, on behalf of the National Land Survey of Finland. One of the aircraft was destroyed when it hit a snow wall during landing in 1965. The other aircraft is currently stored at the Aviation Museum of Central Finland. Pembroke C.1 WV740 (G-BNPH) is privately maintained in RAF markings in the UK (as of 2009) and gives flying displays. Pembroke Mk. 51 s/n K66-B4001 is located at the Essex County Airport in Fairfield, New Jersey. The aircraft was built in 1953 and last served with the Belgium Air Force. The left engine is inoperable and the aircraft is damaged and in a deteriorated condition. It was offered as a warbird contest prize in spring 2009. Pembroke Mk 51 s/n K66-4002 reported to be located at Pierce County Airport, Washington State. Belgian Air Force keeps its RM7 at their Melsbroek premises just across the military air terminal. Air Atlantique Classic Flight at Coventry Airport, England operate Pembroke C.1 G-BXES painted as XL954 in RAF Transport Command Livery. Pembroke SE-BKH (ex RAF XK884) is at Vx�sterx�s Flygmuseum, Sweden, in airworthy condition with Swedish markings. P.66 Pembroke C.1 - Communications and transport version for the RAF, 44 built. P.66 Pembroke C(PR).1 - Photographic reconnaissance version for the RAF, 6 built and 2 conversions from C.1. P.66 Pembroke C51 - export version for Belgium. P.66 Pembroke C52 - export version for Sweden. Swedish military designation Tp 83. P.66 Pembroke C53 - export version for Finland. P.66 Pembroke C54 - export version for West Germany. P.66 President - Civil transport version, 5 built. 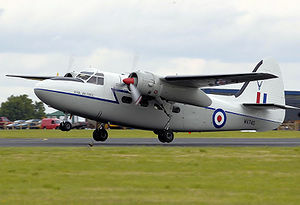 South Rhodesian Air Force two C.1 aircraft diverted from Royal Air Force contract. The Illustrated Encyclopedia of Aircraft (Part Work 1982-1985) London: Orbis Publishing, 1985. Jackson, A.J. British Civil Aircraft since 1919 (Volume 3). London: Putnam, 1974. ISBN 0-370-10014-X.